Don’t be afraid of fat. Choosing a grind that is too lean will produce a burger that is dry and lacks a great beef flavor. Choose a grind with a lean to fat ratio of 80/20. Don’t forget that not all of that fat remains in the burger -- the reason flare-ups occur is because the fat is dripping out of the burger. And that's okay by us. Choose a great product with a course grind. Great product starts with fresh chuck and either corn or grass fed depending on your preference. Both have different flavor profiles that appeal to different people. The Counter Burger in West Hartford uses corn fed because in blind taste tests, our customers prefer the rich beef flavor that a corn diet provides. Also, grass fed beef has a slightly gamier flavor. As for the grind, a course grind will provide more even and faster cooking and a better finished texture because the patty is less dense. It chews more like a steak than a patty. Forming the burgers. Don’t handle the meat too much. 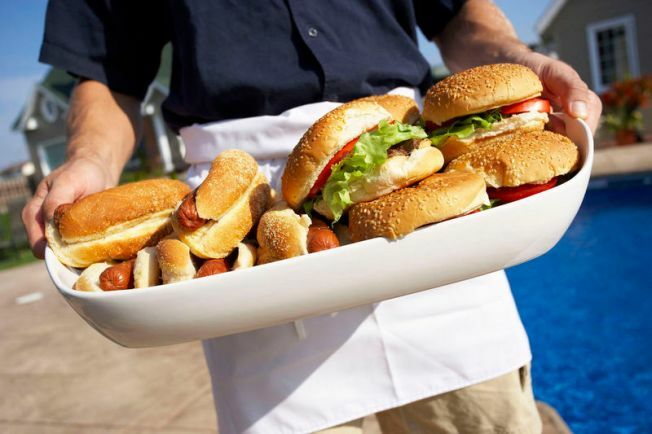 By spending too much time handling the burgers, your body temperature will melt the existing fat in the meat and change the way it cooks and tastes. In addition, don’t squeeze it too much; this defeats the course grind. Use a gentle hand and watch out for cracks that will only get worse as the burger cooks. As for the size, the width of the burger should be about ¼ inch beyond the size of the bun but still have at least 1 to 1.5 inches of thickness. Salt and pepper are a burger's best friend. Use enough salt and pepper so you can see a light dusting layer just before the meat goes on the grill. Salting the meat too far in advance will start to draw out the natural moisture. Remember that not all of the salt and pepper you put on the meat stays on the meat. You will always loose some to the grill. The grill. A true grill master knows that sweet spot between too hot and too cold. A grill that is too hot will end up burning the outside and leaving the inside underdone. A grill that is too cold will not give the meat that great, slightly charred “burger off the grill” flavor. The trick… listen to your burgers. If you put the burger on the grill and you don’t hear anything, immediately take it off and wait for the grill to get hotter. If the burger hits the grill and you hear crackling and see flames, immediately pull it off and wait for the grill to cool down. If you have a surface thermometer, you’re looking for a surface temperature of about 500 degrees, which will give you a good char without burning the outside. Rest. This is a very important step. Let the burgers rest for about 2 minutes. This will not only give you time to melt the cheese, it will allow the juices in the burger to stop moving around from being on a 500 degree surface and stay inside that perfectly charred crust.